Two nights ago, Jonathan and I went to the gym for the first time in almost 2 months. It was so good to be back - of course I didn't want to go when I was comfy on the couch beforehand, but Jon is good at being motivating (i.e. annoying) and once I got on the elliptical, I was happy. We had plans to go yesterday after I babysat, but I was sad and he was sore. Hopefully, tomorrow we can start the routine again. Last night I babysat for one of my favorite kids, Cooper. 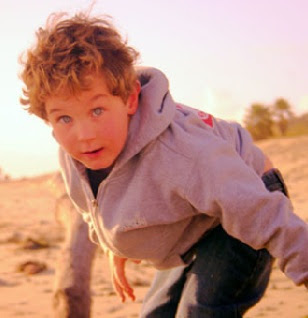 He is a sweet kid with a mop of curly blond hair, a mischievous smile and happens to have Duchenne's Muscular Dystrophy. While it usually doesn't affect our time together (other than me telling him repeatedly to walk with flat feet), sometimes I'll be hanging out with him, drawing monsters or playing Lego Indiana Jones on Wii and I get really sad. This beautiful boy will not see 30. Unless we make it happen. Unless we find a cure, fight for stem cell research, write our representatives to stop wasting money on $5,000 toilets and instead focus on saving little boys' lives. It makes me so angry if I think about the fact that we live in one of the largest states in one of the richest, most well-developed countries in the world and we don't have enough research dollars to do this. It's not just our legislators either, it's all of us. We don't have our priorities straight - the extra Cokes I buy each day could save me $20 a week. $80 a month, $960 a year. If I stopped buying Cokes and donated that money to research, not only would I be a lot healthier, but I would have almost $1000 to further research ways to save Cooper. I told Cooper yesterday that he could come to my wedding (whenever that happens) and he said I could come to his. I almost cried right there. But instead I said, "I'll be there with monsters on." He giggled and it was the best sound I've ever heard.